Let’s talk Art. At the MOMA, Museum of Modern Art in New York, one of the first pieces we came to was a collage of food packages that the artist had eaten in one year. It reminded me of our ‘garbage collage’ we had in college. But this guy sure ate a lot of frozen strawberries. I may not be the best at modern art appreciation. So much of it looks like something a five year old could do if given a large canvas and some paint. But much of it was thought provoking, even beautiful. I was very pleased to finally come to some famous artists. There was VanGogh’s “starry Night”, and works by Picasso and Dali and Warhol! So close I could touch them (but I wouldn’t even try, since there was security EVERYWHERE, and they would tell you to step back from the painting if you got to close). That was amazing. But we could only take so much Modern Art, especially when we had already walked a bunch and been on our feet for hours. While Ryan looked up directions for the next leg of our adventure, I actually laid back and closed my eyes on a padded bench thingy for just a couple of minutes. It felt like heaven. I appreciated the art at the Met art museum more. I tend to gravitate toward the beautiful colors, the landscapes, and the flowers. And there were so many works of art from all over, and from so very long ago. We could have spent days there. Or weeks, even. It was truly amazing. And I’m glad it was the first museum we went to–before we were “museumed out”. There were tons of school groups there, and I felt a little envious of the New Yorkers who could come and see this amazing museum anytime they wanted. Not that they all do. We tend to not always appreciate the gems in our own backyard. Which reminds me, have you gone to see the Carl Bloch exhibit at the BYU art museum? We are going next week. I’ve heard it’s amazing. And it’s right here local, and it’s free. So we don’t have to travel all the way across the country to experience breathtaking works of art. Hey, isn’t that Paige on the Late Show? Yes, we were on TV on the Late Show with David Letterman. I hadn’t seen the clip, because I didn’t stay up late enough to watch it that night, and a certain son of ours forgot to set the machine to record it, even though I asked him to. So, Ryan found it online and cut it down to just the clip that we are in, so we can show our kids and our friends. Coincidentally, the song that they are playing in the background is one we have played in bells. I can’t remember what it’s called, but I know we’ve played it. So, there you have it. Our big Late Night debut. Someone at church mentioned that they had seen us on tv, and my sweet young neighbor came up to me and said, “Sister Erickson, were you really on the David Letterman show?” I had to explain that we were in the AUDIENCE, not guests on the show. Maybe someday. Live from New York, It’s Thursday night! It doesn’t have the same ring to it, does it? But we are sitting in our hotel room, exhausted from a long day of walking, walking, walking, and we are now kicking back watching the BYU/Florida game. Go Jimmer! We finally paid the $16.99 for internet tonight, so I thought I would blog a little bit about what we’ve been doing here in NY. Oh, New York! We’ve been having a wonderful time in NY! Monday, we arrived here, exhausted from our long day of flying, took a taxi to our hotel and checked into the Marriott Marquis. It’s a far cry from the run down Comfort inn (or whatever it was) we stayed in when we came before. We were so tired, but we went out exploring. Our hotel is right off of Broadway, and there we were in times square! Look- the Adams family is a musical on Broadway! Oh, look, it’s a show about Alice in Wonderland, hey, there’s all the lights of Time’s Square! It was chilly as we walked around, and we soon realized we were pretty hungry. We’d split a sandwich that we bought in the airport in Texas, and were both on the hungry side. We ended up eating in an Irish Pub called Long Room. Oh, look at the beer list! We’ll have water, thank you. I ordered a sandwich called “Thanksgiving dinner on a ciabatta,” and Ryan had the fish and chips. Very good food! After our dinner, we explored some more, but not too much, because we were really dog tired. We did find a Walgreens and got some snacks, and came back to our room to crash. We felt kind of wimpy calling it a night so very early. It was “early” by New York standards, but we called it a night anyway. Tuesday we planned on getting up and out of here early, but didn’t leave until after 8:30. We wanted to go to the Metropolitan Museum of Art, but had to find how to get there. After a few wrong turns and a backtrack, we found where to buy metro cards, then found the correct bus stop to take us uptown. It was fun to take the bus instead of the subway, because you can actually see where you are going. We took the bus up 5th avenue and saw all the designer shops. We found the Met, and made our way inside. Where to go? There’s something like six floors with about a million wings each. We started out in the European artists, and saw many, many paintings of Mary and Jesus. Chubby cherubs with halos and all that. We saw the Egyptian exhibits, sarcophagi, musical instruments, early armor and furniture. Wow! We had to take a break for some lunch about then, and ate in the museum cafe. We were running out of time, but really wanted to see the 19th century European artists, so we hurried quickly to the other side of the building and up a couple floors. Wow! Renoir, Matisse, and Monet! Degas, Manet and more…. Amazing! We could have stayed there for 9 days, but alas, we had to move on to our next adventure. Feet starting to ache, we waited quite a while for the bus in the cold wind. We needed to navigate our way back to midtown to check in with the Late show, so we could get our tickets. We stopped in quickly to see Rupert Gee at the Hello Deli, and then got in line. Yes, even the people ‘”on the list” needed to stand in line. We got up to the front, checked our name on the list, and eventually got our tickets. Then we had an hour to kill before we had to be back. We moseyed across the street to the Europa cafe, where it was warm and we could share a hot chocolate and use the bathroom. We ended up staying there for nearly an hour, but they didn’t seem to mind. We didn’t want to get too far away and then have to come back. We had to line up in the “yellow line” and then get in numerical order. We were number 96 and 97, whatever that means. Once inside, we had a lot of time to stand there in line, so we got pretty chummy with the people in line behind us. The lady lived here in NY, we think her friend said something about being from Afghanistan. When we got inside, it was all fun and clapping to the band. They tell you to laugh and clap at everything, even if you don’t think it’s that funny. ‘If Dave tells a joke, laugh now and think about it on the way home,’ they say. When Dave finally came out, he was indeed funny. At a commercial break, the three people in front of us were asked to leave their seats, and three other people came and took those seats. Huh? We knew something was up, because there was a camera aimed right at us. Sure enough, Alan (the announcer) came out in the audience, and ripped the moustache off the man who was sitting RIGHT in front of Ryan. We haven’t seen it yet, but I’m told we were on camera! Cool, huh? You might be able to watch that episode here, if you are interested. By the time that taping was over, we were ready to get out and walk again. We headed over to Rockefeller center for a “top of the rock tour”. You get to go up to the top of the building, kind of like at the Empire State Building, but not so high. I was hoping we’d run into Alec Baldwin or Tina Fey while there, but no such luck. No, we did not pay $20 to ice skate, but we did watch some skaters. I’m going to end this post now, because the BYU game is tied with two minutes to go. I must watch the game and quit the typing. But don’t worry, there will be MUCH more about the trip in the next couple of days! Back in November, I was lucky enough to win a contest. A big contest, actually. A ‘shopping trip’ to NYC! It was during a promotion of four weeks of fly-aways from a local country station (101.5 the Eagle, to be specific). There were four different trips to concerts, etc, and honestly, I won the best one! Because it wasn’t associated with an event, I was able to push the trip back to a time when I could actually go, hence the after roadshow scheduling. When I was talking with Stacey, from Stoney Creek Records, she was great about the scheduling. The prize was supposed to be two nights hotel and the flights, plus $500 spending cash. But when I was scheduling, she told me she could just pay for two more nights of the hotel instead of giving me a giftcard, if I wanted. YES! Especially since the hotel is $300 per night! So, it should be a pretty fun trip. And if that weren’t enough to do, I’ve got us tickets to see the Late Show with David Letterman for Tuesday (so you could tune in Tuesday night and maybe catch a glimpse of us in the crowd!) I was a little worried when I got the call from the Late Show, and they told me I had to call a guy named Jack and answer a trivia question before they would let me have tickets. UGH! What kind of trivia question? Do I have to watch teh show every night? Do I have to know who the guest was the day before? So I googled something like “trivia questions for Late Show tickets”, and read up about other people’s experiences. I also took a quiz to prepare me. (Questions like ‘where did Dave go to school (can’t remember), what is the name of the production company (worldwide pants), who is Biff Henderson, what is the name of the Deli nearby (Hello Deli), and who runs it (Rupert G) and stuff like that. I read a few different web pages about Dave and the history of the show, and then I gathered my courage to call Jack. He put me on hold for a minute, then asked me the big question, “Alan Kalter has been a part of the show for many years. What is his job?” I knew that one right away! He’s the announcer! And it’s a good thing they didn’t ask me, “who is the announcer”, because while I would have said Alan right away, I don’t think I could have come up with his last name. So, tickets we have! I also requested tickets for the Nate Berkus Show on Wednesday (not sure when that will be televised, but I’ll let you know). Isn’t he the cutest? He’s the guy with the good hair, not the other guy who works at Lowe’s, by the way. Ryan may think I’m challenging his manhood a little by making him go to a ‘design show’, but he’ll just have to deal with it, and my tiny little crush on Nate, since I won the trip and I’m taking him as my guest. I tried to get tickets to see Rachel Ray, but haven’t heard back from then. There’s always stand-by, I guess, if we decide we want to try to do that. Just today I got a call from ‘the View’, since I had also requested tickets to that show. But they aren’t taping on Thursday, and we couldn’t do the time they offered us on Tuesday because it would conflict with Letterman’s show. No problem. Ryan is relieved, and said he “dodged a bullet with that one.” What? I was requesting tickets so I could have options, people. We have actually been to the Late Show once before when we went to NY in 2006, but this should hopefully be a little bit slicker process, since we already have the tickets. When we went before, we had NO plan for our three day adventure, and literally just started walking around and ended up at Spamalot. This time, I’m trying to figure out how to use our time wisely, not just wander around aimlessly. And I don’t have the burning desire to spend hundreds of bucks on theater tickets. I’ve seen Wicked twice, otherwise that would be at the top of my list. I’m also not too concerned about all the great FOOD in New York. We won’t have a lot of time to eat at fancy places, so we’ll probably just stop and eat when we are hungry. Except for one night, when we have a dinner invitation to eat with a Control4 dealer that Ryan works with. When Ryan told him he was coming to NY, he invited him to come and see his business and that he would take us out to dinner. Well, I’m all for free dinner, so I’m on board. Ryan’s not much of a shopper, either, so we won’t be spending hours touring the garment district and looking for clothes. But, if we should happen upon cute purses or shoes, or see a store that’s especially inviting, I might just have to pull him inside. Hopefully there will be a chair or a bench where he can sit. But I’m such a cheapskate, I can’t see me forking out big bucks for some designer clothes, unless it’s a knock-off. We’ll have to see. button-down shirt, sweater, or blazer.” So no jeans and t-shirts for that show, I guess. Then I don’t know if it will be warm, cold, rainy or sunny, so I’ve got to watch the weather for next week and pack for all possibilities. So stay tuned for pictures, because I’m sure we will be taking LOTS of them!! What a fun weekend we had around here! Thursday night I took 3 of the kids to Disney on Ice, and we successfully managed to not buy any of the overpriced snacks and blinky cups/swords/crap. Although I did have to have a serious talk with John about not ASKING for the stuff. Megan and I decided to count how many vendors came by advertising their stuff, and we counted 51 times that someone came by our row before the show started. In an effort to show how some non frugal people can be at events like this, we mentally counted up how much money the people sitting next to us spent. Two popcorns, three snowcones, a blinky sword, etc. We estimated they had spend around $85 on snacks while there. Duh! We were sorely in the minority. But that’s how we do things, folks. Free tickets, park for free when you eat at Crown burger, bring our own treats in our pockets. Our evening cost $21. Boo-Yeah! Friday Ryan and I attended a funeral, which wasn’t so fun, but at least we were spending time together, right? That night I went out to dinner with my best girlfriends, and it was fun to chat and eat and catch up with them! When I came home, our houseguests had arrived and the kids were all playing, playing, playing. We love it when Robin and her kids come to visit us! The kids have played board games, group games, video games, and just had a great time together. Saturday, Robin and I were filled with hope as we went to search for garage sales. Wonders never cease, we found several! I bought a really cute chicken platter (yep, more chickens!) that I’m excited about. I also picked up an inflatable raft and paddles that I think might be fun to use this summer if we go to a lake. After the yard sale adventure, we got our girls and went up to Kingsbury Hall for Odyssey Dance Theater’s Dancescapes. It was a GREAT show, but then everything that Odyssey Dance Theater does is great. Since it was the matinee, it wasn’t very crowded, and we were able to avoid sitting in our last row, back of the balcony tickets (yes, they were free) and had good balcony seats. There were several “mini-intermissions”, and I tried to get Robin and our girls to move forward at each one. By the last set, we were smack dab in the center of the second row. Wow! Those dancers are amazing. We had a nice time, and it was fun to take our daughters. Sunday we went to church, and afterward had a wonderful dinner. First steak grilling of the year! Yum. And then we got to watch our favorite show, the Amazing Race. Monday we lucked out in that the kids are out of school. It’s a ‘snow make-up day’. Here in Utah, they schedule one or two days a year for a make up day, just in case school has to be closed because of snow. I’ve decided that we should ALWAYS have the Monday after the daylight savings time switch off of school. It gives us one more day to ease into the earlier time. But for my kids, it gives them one more day to play with their Arizona friends without the burden of school, homework, and our regular weekly schedule getting in the way. Not that I feel too sorry for them, for they will surely find PLENTY of time to play with their friends for the rest of the week, but it’s nice to not have to ship them off to school when they have guests staying here. We plan to go see Tangled, and end the long weekend with a family game night party at Ryan’s sister’s house. You know what they say about one person’s trash being another person’s treasure, right? I totally believe that, much to the irritation of my dear husband. He doesn’t always see the ‘vision’ in my garage sale or freecycle acquisitions. But he only grumbles about 75% of the time, so that’s not so bad, right? I’ve learned to not pick up anything ‘for him’ or ‘for him to fix’ because it’s not happenin’. Why does he doubt me? I’ve found some wonderful stuff! Like that awesome porch swing that fit the space on our porch like it had been custom made for us! The hardware to hang it cost more than the swing itself. But there was some grumbling involved, because it meant that dear husband had to buy the hardware, install the hardware, and hang that swing. While I can’t say he’s supportive of my garage sale habit, he has at least accepted that I really like to do the garage sale thing, and sometimes I even take the kids along, which lets him sleep in uninterrupted on a Saturday morning. (Who am I kidding? He’ll sleep in uninterrupted even if the kids ARE there.) He will also give me the cash in his wallet when I don’t have any cash. He does, however, always insist on asking how much I paid for an item, and even if it’s a SCREAMING deal, his automatic reaction is usually that I paid too much. Come on, man–a DOLLAR? How can a DOLLAR be too much. Oh, well. I try to ignore his little comments about overpaying, and he tried to ignore my piles of stuff that I don’t quite know what to do with, but isn’t this pretty? I have made some mistakes and bought stuff that really is junk once or twice (there is a little incident over bookshelves that we will never EVER speak of again) and then I tuck my figurative tail between my legs and admit that it was a foolish purchase and a waste of money, and we go on. 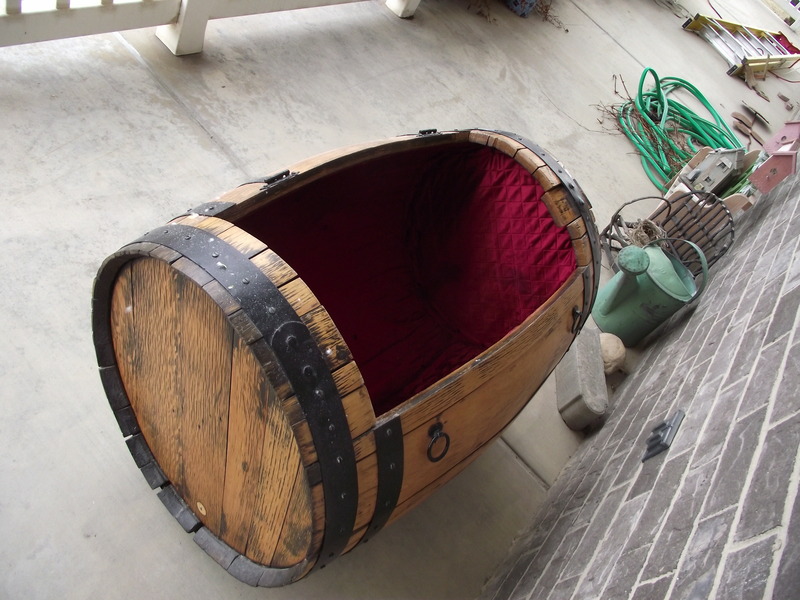 A few years ago, I bought this really cool old wine barrel at a garage sale. I paid either about $5 dollars for it. I like the old looking things that have been re-purposed and given new life. And I like barrels. I have one outside in my flowerbeds. 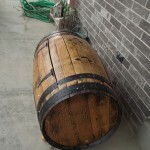 So, I muscled this lovely barrel into the back of my van that, like every good garage sale diva knows, sometimes a car has to act like a truck. As you can see, it’s got fabric lining, little feet on the bottom, and a top that closes. Not really knowing what to do with it, we hauled it upstairs to Megan’s room, and she filled it to the brim with stuffed animals. Fast forward a few years, and Megan’s room is now Megan and Natalie’s room, and it’s time to make a change and give the girls individual beds instead of a bunkbed. In order to do that, we had to get rid of a few pieces of furniture, and the trunk was one of them. There was much complaining about where the animals were going to go, but it had to go. Taking a chance that someone else out there might love that trunk as much as I had, I listed it on KSL.com. 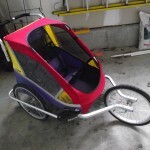 On a whim, I also listed our faithful double jogger stroller/bike trailer, since everyone rides their own bikes, and we don’t really need that anymore. Within minutes of posting the ad, I had someone calling. 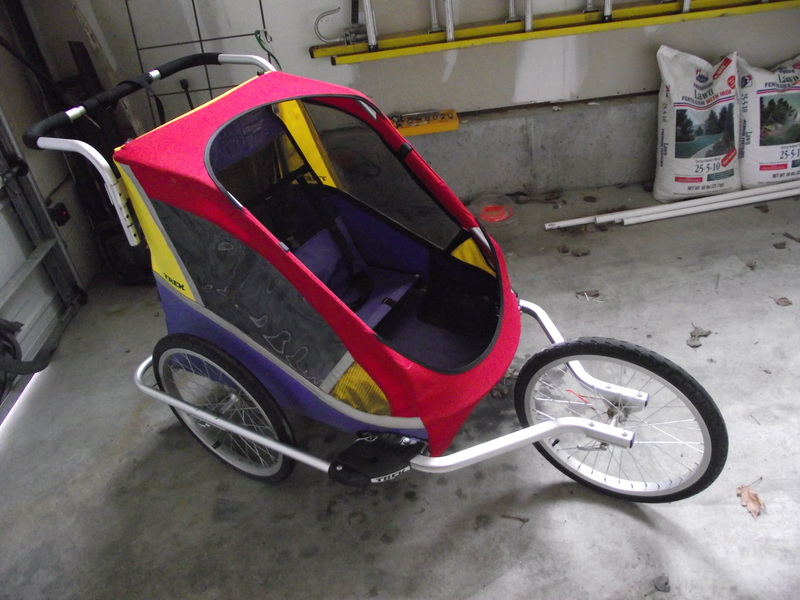 For the stroller, not the trunk. Dang, I should have listed that for more money, and I shouldn’t have accepted the first low ball offer, just because they were willing to drive over RIGHT away and buy it. Oh, well. I did at least get $125 for that 10 year old stroller. No interest in the chest thing, though. Not willing to just give it away, I scooted it carefully into the family room and put all the throw blankets that tend to congregate on the couch into the trunk. I still like it, and if I can arrange things to use it in the family room, then so be it. As soon as I realize that it looks pretty good in the family room all useful and full of blankets, I get a call about it. Someone was interested in that barrel. But…but I just… OK. I had listed it for $100, which I knew was a pretty high amount, so I was ok to come down to $80. And she wanted it right away and was going to send her brother over to pick it up for her. I emptied it out, put the blankets other places, and maneuvered it over to the front door. I’m happy that it has found a new home where someone will hopefully love and appreciate it. 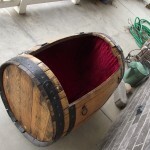 She said on the phone she was decorating a pirate room and thought that chest would fit in perfectly. And I think I scored a pretty sweet deal. Nothing like my good friend Robin, who can buy a plate for $1 and sell it for $150 on EBAY, but at least I made some money on the deal. Not only did I get to use that barrel trunk for several years to store animals in my girls’ room, but I made $75 bucks on it. Kohl’s, how can I quit you when you just keep giving me awesome sale codes? I mean, come ON. And, since I deserve a pat on the back from our awesome roadshow success last night, and today is the beginning of Lent and I have once again given up sugar, it’s the perfect time to do a tiny bit of shopping. Kohls, itâ€™s Kohls Cash timeâ€”youâ€™ll earn $10 for every $50 you spend. Have a Kohls charge card? It gets even better, because you can use coupon code LOVE2SHOP for 30% off your entire order and code FREE4MVC for free shipping on any size order. I decided that this top would be the perfect addition to my wardrobe this spring. I also picked up a new suitcase for Ryan, since we have a very exciting trip coming up. Oh, and if you check out the sale, don’t forget to click on the box to go through ShopatHome to make your purchase, because they will give you an additional 3% cash back. No, it’s not free, but when you combine the sale with the Kohl’s cash and the discount, and the cash back, it’s pretty dang close. My Saturday was spent with my bell choir peeps. Can I call them ‘peeps’? Sure, I can. Every year the American Guild of English Handbell Ringers sponsors a Spring Ring, where bell choirs from all over the state come together for an all day ring session with a guest clinician. Our choir attends every other year, and this is my third time at this event. It’s usually held at a school, in the gym. Imagine if you will 19 bell choirs all set up together in one room, playing the same pieces. Amazing sound. There were 253 of us there. I must admit I’ve had a little bit of a bad attitude about this before. It’s just such a long day. A LONG day of ringing bells. It’s killer on your feet, legs, back, shoulders, hands….well, it’s just very taxing. And I’m reminded that I’m not young anymore. Getting older every year, in fact. But our guest clinician, Timothy Waugh, was really amazing. He was so positive and had a wonderful attitude. We weren’t just a whole bunch of choirs playing the same songs, but we were trying our best to tell stories in song. I learned a lot and it was a really good experience. Exhausting, but good. Thankfully, we brought our own crew, who did all the unloading and loading for us. It’s a HUGE ordeal to move a bell choir of our size, with 7 octaves of bells, chimes in their big old cases, tables, pads, risers, etc. They have to transport all our stuff in a big semi that is rented for the day. We are lucky that way. At the end of the day, we performed a short concert. Four of the choirs performed solos (we were one of those solo performing groups) and we played all six of the songs we had worked on through the day. Although our solo could have gone better, the concert was fun. After we put everything away and I changed out of my sparkley dress, I was hauling all my stuff out to the parking lot. I had my dress, my purse, a second pair of shoes, my water bottle, and my piece of carpet to stand on. I could barely hold on to all my stuff, and I wandered out to look for my car. Ahem. Excuse me–to look for RYAN’S car. I knew I had parked pretty close, but I couldn’t find it. I kept clicking the “unlock” button hoping the car would blink at me, but no such luck. Our director, Tom, walked by, and asked if I was lost. “I can’t find my car,” I said, feeling really stupid. He asked if I wanted to drive around a look for it, but I was pretty sure I could find it eventually. But then, after walking around some more, I still couldn’t find it. Another friend from the choir stopped and asked if I needed help. I must have looked rather forlorn in my exhausted state hauling all my gear. I took her up on her offer to drive around and look for it. It’s such a small car, and it’s dark grey–not a stand out color–so it’s easy to misplace it, right? Tom pulled around again and rolled down his window. “Are you sure you parked in this lot?” he said. Oh. There’s more than one lot? Hello! So my friend Serena drove me around to the other lot on the OTHER side of the school, and there it was. Our little grey car! I just walked out following everyone else, not realizing I was walking out the WRONG way. Ugh. Once I found the car, I started to relax a little bit. I drove over to my sister’s house to give her a birthday present. My sister who is expecting a baby any day to add to her current houseful of kids. She is amazing. Her kids are all so cute and happy, and they all wanted to show me ALL their toys while their mom was trying to talk to me. I obviously don’t visit enough. It was nice to just sit and visit with her. Hopefully all will go well with this new baby and she will be born without problems. They are worried about her measuring small, so she has to go in for all kinds of tests. I think her poor old uterus is just tired and worn out! By the time I got home, it was almost bed time for the kids. They took a break from their video game extravaganza to say hi to me, while I ate some dinner and then dragged myself up and flopped on the bed. I turned on the tv and flipped some channels, and saw that they were playing Les Miserables on PBS. Amazing. I settled in, got some Kleenex, and watched the second half. In an attempt to avoid going to bed, the kids all wandered in, and climbed on my bed. “What is this?” they asked, “Who is that?” “Why is she crying?” Hey, I’m not here to give you a commentary, I thought. But I tried to explain it in simple terms, and they were soon enthralled, as well. It was such a nice moment. In my cozy bed, surrounded by my kids, trying to instill in them a love of all things musical. But then Ryan came in, scoffed at my viewing choice (he’s not a fan) and sent the kids to bed. It’s a good thing, because they really drag out those PBS pledge drive shows. But I kept watching, tears rolling down my cheeks. It’s just all so SAD. But the music is so beautiful! Even though Ryan doesn’t like the show, he was kind enough to set it to record the next showing, since I had missed the whole first half. He may be crotchety and not like musicals, but he knows me, and is sweet like that. All in all a good day. Exhausting. I got zero Saturday jobs done, and neither did my family, but we’ll survive the mess, and I’ll remember the musical experience of the day. Our Roadshow, by the way, will be performed tomorrow. I’m hoping I can get some good video and post a song or two to show you how incredible these kids are, and what a great show we’ve created. And then I will sigh a great big sigh of relief to let you all know that I have survived. In our house, if you run out of cheese, it’s a national tragedy. Call someone and see if we can get some FIMA money…we’re about out of cheese! There’s the teenaged boy who comes home from school and makes himself a ham and cheese sandwich every day and piles on the slabs of cheese. There’s the grade school kids who only take school lunch on pizza day, and every other day they take home lunch, which is usually a ham and cheese sandwich and some other stuff. I buy the big blocks of cheddar and the HUGE slab of presliced American Cheese at Costco. Because I don’t want to be running to the store every other day for cheese. Or ham. I buy the three packs of sliced lunchmeat ham and turkey, and then I pick up ham at the grocery store when it’s on clearance and I pop it in the freezer. But every once in a while, I can’t find any ham in the freezer, and then people start to freak out. Seriously? Yes. This is the actual transcript of an actual conversation. And sometimes, there is the perfect storm of tragedy when we are out of BOTH cheese AND ham. And when that happens, we might as well all just lay down and die, because what is the point of living? Today is one of those days. We are out of the sliced American Cheese. Yes, there’s a whole block of cheddar, but to a few people in the house, Cheddar is ignored. It’s not the fake AMERICAN cheese they want. Oh, yeah, and we’re out of ham. I’m on my way out the door as I type this, really. Because when those hungry little people come home from school, there had better be something for them to eat. Do you have a tragedy food in your house? Something that if you run out, it’s considered a national emergency?